It’s pretty much a given that traditional marketing methods to keep sales pipelines full don’t work anymore. Print ads, cold calling, and email blasts are relics of the past. Customers are inundated with advertisements and calls to their homes with sales pitches for products they don’t need. Customers fought back with spam blockers and do not call lists. To combat customers who were onto traditional marketing tactics, companies turned to the Internet and SEO tactics to increase website traffic. They went on Facebook, posted on Pinterest, added keywords, and published press releases for every possible announcement. So what went wrong? Where are all the customers? Why aren’t social media & SEO strategies enough? The KEY is to have a plan that ties content with SEO and social media in a cohesive and meaningful way. AKA the solution to getting found by your customers online. By reaching out through strategically placed content, linking it through relevant social media channels, and following SEO trends, you will attract customers most interested in what your company has to offer. Inbound analytics measure your actions to ensure the connection between content, social media, and SEO is delivering the results you need. 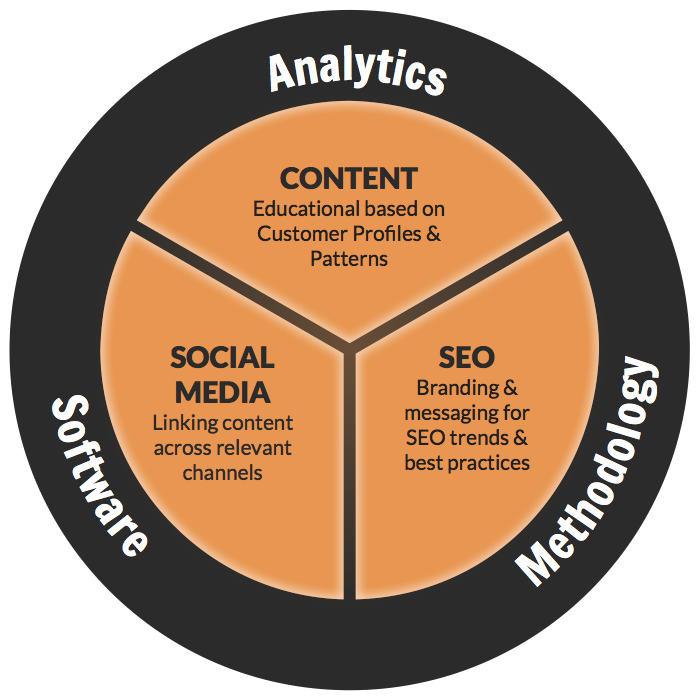 Inbound software allows customers attracted to your content to reap rewards with valuable content. Inbound methodology links your marketing team with your sales team to convert visitors attracted to your website into customers and keep them delighted. Take a look at your content and see if it is tied in with your social media and SEO in a meaningful way. If you aren’t getting the results you’re hoping for, maybe inbound is your missing link!